Last night I watched the Devils demoralize the Rangers in the third round of the Stanley Cup playoffs by scoring a goal late in the 3rd period to win 4-3. The Devils had jumped out to a 3-0 lead, scoring 3 goals in the first period, but the Rangers came back in the second period with 2 goals and tied the game early in the 3rd period. But the Rangers are not a high-scoring hockey team and rarely score more than 3 goals in a game. And, sure enough, in front of their home fans, they were unable to score a 4th goal. For those of you who aren’t hockey fans–Why isn’t everyone a hockey fan? It’s the most elegant sport in the world, and, folks, the players are wearing ice skates! Come on!–the Rangers are based in NYC and play in MSG (Madison Square Garden), the most famous sports venue in the world, and the Devils are based in Newark, NJ. Both teams have won The Cup before–the Rangers are one of the original six NHL teams–and they both play in the same division (along with my beloved Pittsburgh Penguins, so I hate both teams). Both teams have players I like as well as players I don’t like, but I find that I am cheering for the Devils. I’m shocked by this. The Devils are notorious for playing the most boring hockey in all the world. They try to score the first goal, then put everyone, including the opposing players, to sleep with the trap. Ugh! But the Devils have a new coach, Peter DeBoer, and he has totally changed the Devils style of play. They are more physical and more offensively minded. Dare I say it? The Devils are actually playing offense! But that’s not why I find myself cheering for a hated rival of the Pens. No, I’m not cheering for the Devils because they are playing a more exciting brand of hockey; I’m cheering for them because I love their goaltender, 40-year-old Martin Brodeur. It’s hard not to like Brodeur. Although he’s an old guy (for a professional hockey player), he is still one of the best net-minders in the NHL. I just can’t help but pull for him and his team. The series now stands at Devils 3 games, Rangers 2 games, with game 6 to be played in Newark on Friday. Can the Devils win the Eastern Division championship and the coveted Prince of Wales Cup at home? Stay tuned. Of course, during last night’s game, which was, by the way, quite exciting, I worked on The Spider Queen. She’s coming along at a rapid pace. but I don’t have a Lazy Kate. So I improvised. 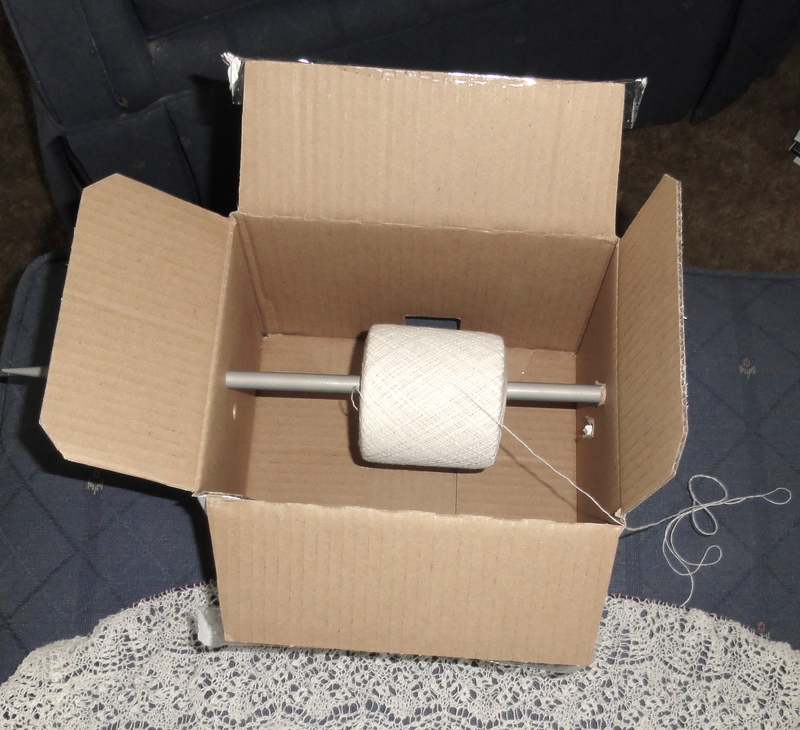 I stuck a knitting needle through one side of a box, put the needle through the “spool” of yarn,” and stuck the knitting needle through the other side of the box. Voilà! A Lazy Kate! 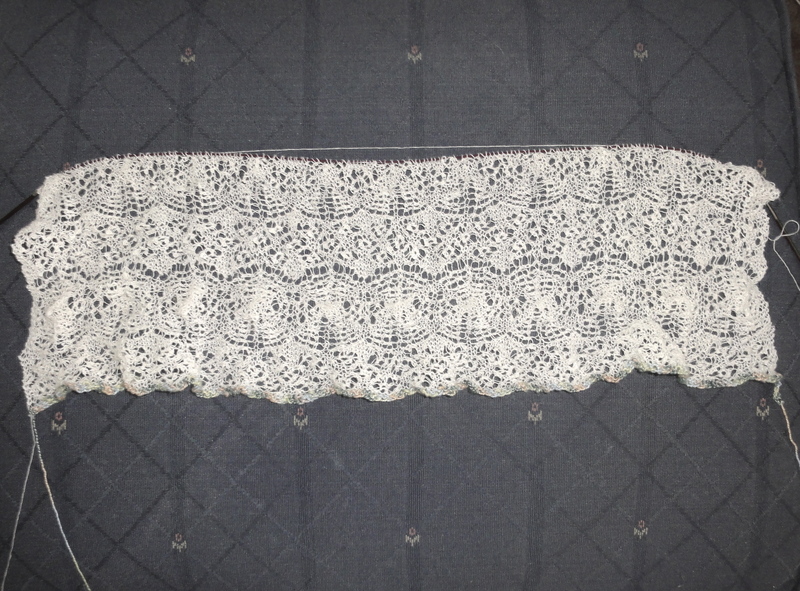 This entry was posted in Knitting, Lace Shawls and tagged knitting and hockey, Lazy Kate, stanley cup playoffs, The Spider Queen Shawl. Bookmark the permalink.